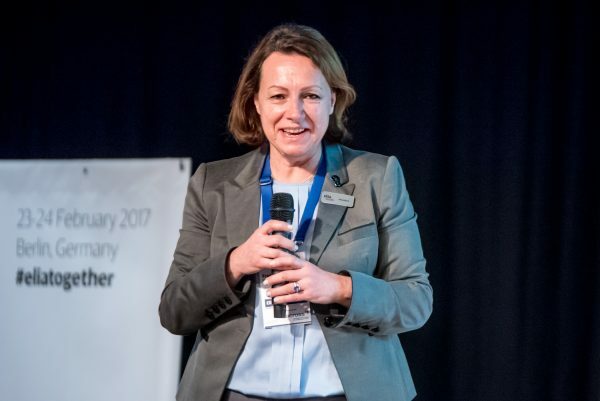 With the Call for Candidates closing on 11 May 2018, Elia President Françoise Bajon explains how being on the Elia Board helps to build your professional muscles. What motivated you to join Elia, then stand for election to President? “It was more of an emotional decision than an educated one! I was at ND Stockholm when Roberto [Ganzerli, Founding Member of Elia] took my arm and said ‘I want to ask you if you want to join the Board of Elia.’ It took me two seconds to say ‘yes of course!’ The fact that he wanted me on the Board was recognition that I could do the job. On another occasion, Elia was working with a team building coach. One day I was talking enthusiastically with him about Elia and the elections and he said ‘You should run for President.’ Again, this was someone else recognising my capacity that provided confirmation that I could do the job. And so I ran for President. This was the catalyst. How do you benefit from being on the Board? “It’s a unique opportunity to be exposed to high profile people and to work with them as peers. In our companies, as business owners, we are always the boss. With the Board, you are talking with peers, working on projects with people who may think differently, have bright ideas and look beyond. This has been a marvelous asset. You can have bright people with great ideas at work but there is always the hierarchy that impacts the dynamic as the CEO is always the one that makes the decision. This changes the dynamic and the mindset. The need for consensus obliges you to work hard on your ideas because you have to convince others. I must say that I have collaborated with incredible people within the Board over the years. We were not always in agreement. Their personality and their personal and professional background were diverse. They have all brought inspiration, support, strength and motivation. Last but not least, we had much fun together! How has your company benefited? “I cannot say because I have not used my position as a marketing tool. But it doesn’t do any harm! The key benefit to the company is the fact that one of the bosses has grown and matured her skills. Also the fact of being the President of an association and that I was re-elected has been motivational for the team. In addition, comments made by other Board members have influenced how I’ve done things in the company. What’s the best thing about working for Elia? “Paradoxically, in recent years, my role as President has sometimes stopped young people and new members from approaching me. For example, in Mallorca last year, after introducing myself to someone new, the person would say, ‘Oh, I don’t want to disturb you, you’re so busy…’ So I’d like to take the opportunity to say the same as I did in Mallorca – I’m never too busy so please, come and say hello!